What is Mendelian-mutationism? And why do we argue in a recent paper in that it represents a forgotten evolutionary synthesis (Stoltzfus and Cable, 2014, Mendelian-Mutationism: The Forgotten Evolutionary Synthesis. J Hist Biol. doi:10.1007/s10739-014-9383-2)? 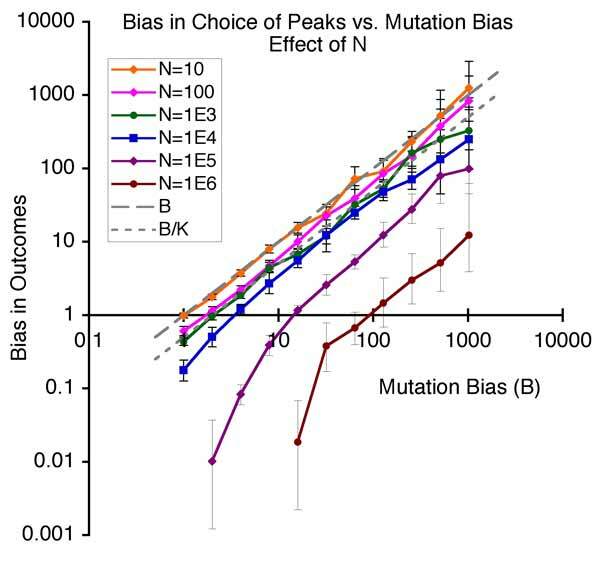 Effect of mutation bias in the 1-step adaptation model of Yampolsky & Stoltzfus, 2001. The greater the bias in mutation, the greater the tendency to evolve in the mutationally favored direction. For me, the story started a long time ago with our theoretical demonstration (graph at right) that bias in the introduction of variation (by mutation-and-altered-development) is a fundamental cause of non-randomness in evolution (Yampolsky & Stoltzfus, 2001). The novelty of this claim bothered me deeply. Why? Here was a basic principle— a causal link between non-randomness in biological inputs (mutational and developmental biases) and non-randomness in evolutionary outputs— as fundamental as the concept of selection or drift. Yet, this principle was not mentioned in any textbook of evolution or population genetics (indeed, there is even a classical population-genetic argument against a determinative role for mutational biases). I could not even find this principle in the research literature! When it comes to contemplating the impact of biases in variation, evolutionary biologists habitually assume that such an impact is impossible, except in the special case of (1) rigid constraints (i.e., the impossibility of generating form B means we’ll get A or C instead), or (2) neutral evolution. We knew that all of this was incorrect. This prompted 2 questions. Why wasn’t a general connection between biases in variation and biases in evolution recognized long ago, e.g., by Wright, Haldane or Fisher? And, why— after it was discovered and published in 2001— didn’t this inspire a revolution? I’m still puzzling over the second, admittedly naive, question. 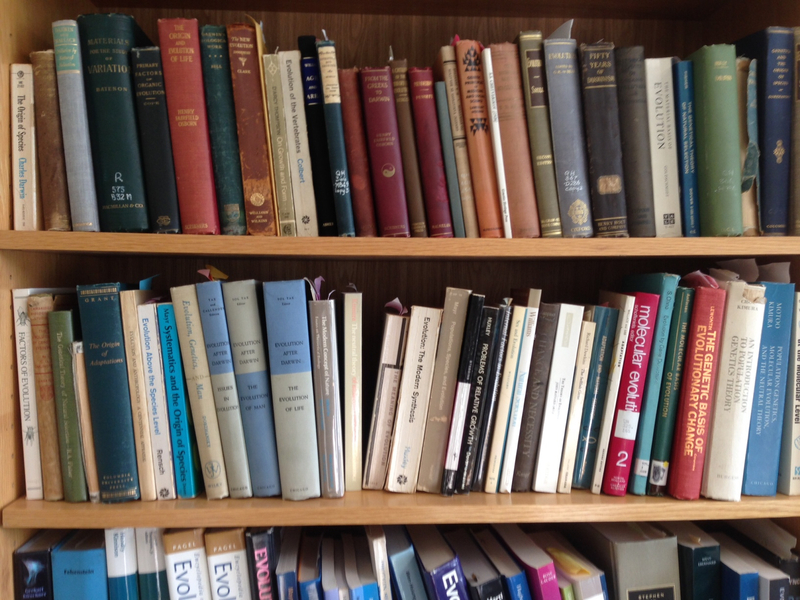 To address the first question, I’ve spent an inordinate amount of time studying the development of evolutionary thought (bookshelf at right). The short answer is this: the notion that mutation has a dispositional role in evolution, influencing its rate and direction, represents a kind of “internal” causation, an internal source of direction in evolution, that Darwin’s followers rejected as illegitimate. Ever since, it has been a blind spot in evolutionary thinking. The nature of this rejection is hard to comprehend today, due to a process of amnesia and theory-drift. Nearly all evolutionary biologists today believe that evolutionary biology has a prevailing theory, and that this theory— called the Modern Synthesis or modern neo-Darwinism— came together in the mid-20th century. What few realize is how far the common conception of this theory has drifted from its original intentions. The original Modern Synthesis was held together with Darwinian doctrines that most scientists today do not accept, such as the doctrine of gradualism, the idea that selection is creative, or the rejection of any internal causes of direction. We can think of these as the “soft parts” of the Modern Synthesis, the muscles and connective tissue that gave it shape and motion. 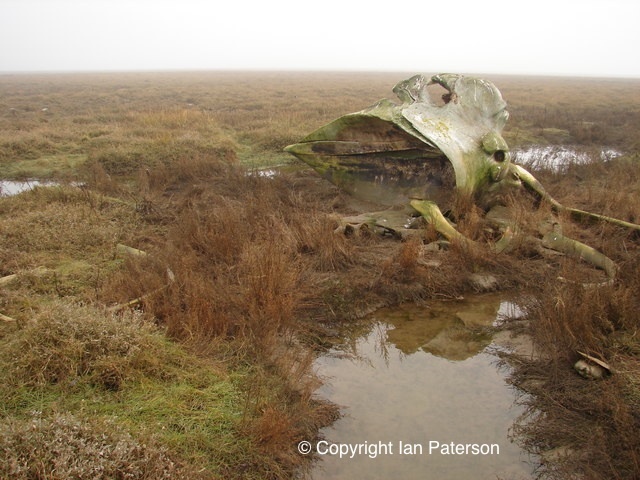 The soft bits of this whale carcass rotted away, leaving only the bones. Over time, the Darwinian character of the Modern Synthesis has rotted away, leaving only the more resilient parts. This is why scientists today think of the Modern Synthesis as a kind of open-ended framework for understanding evolution. They are looking at an open-ended skeleton. Our study of early geneticists revealed that this skeleton predates the Modern Synthesis. There was an earlier Mendelian-Mutationist Synthesis that combined mutation, heredity and selection, without Darwinian doctrinal commitments to gradualism, the creativity of selection, and the “randomness” (non-importance) of mutation. What most scientists today think of as the Modern Synthesis is actually the forgotten Mendelian-Mutationist synthesis. Like scientists today, the early geneticists or “mutationists” welcomed both selection and neutrality, allowed both gradual change and saltations, and welcomed the idea that biases in mutation could be the cause of parallelisms or trends. The new paper by Stoltzfus and Cable describes what the early geneticists believed about how evolution works, and what they contributed to the foundations of evolutionary thought. It also explains why they rejected Darwin’s theory (another case in which the popular conception of a theory today does not match what its historical meaning). But that’s only half of the story. The other big theme is historiography, the telling of history. The disconnect between what actually happened and what scientists believe is not just a matter of theory-drift. “History is written by the victors,” Churchill said. In this case, the victorious architects of the Modern Synthesis promulgated a view of early geneticists as bumbling fools who saw mutation and selection as opposing principles, and who couldn’t think synthetically. The period of 1900 to 1920, actually a rich period in which early geneticists laid the foundations of modern evolutionary thought, is described perversely as part of an “eclipse of Darwinism”— a period of darkness when the world was deprived of His light— lasting until Darwinism is re-born in the Modern Synthesis. This story-telling has been so influential that, when contemporary scientists list historically important figures, all key figures of the Mendelian-Mutationist synthesis are removed, Soviet-style (see figure below). 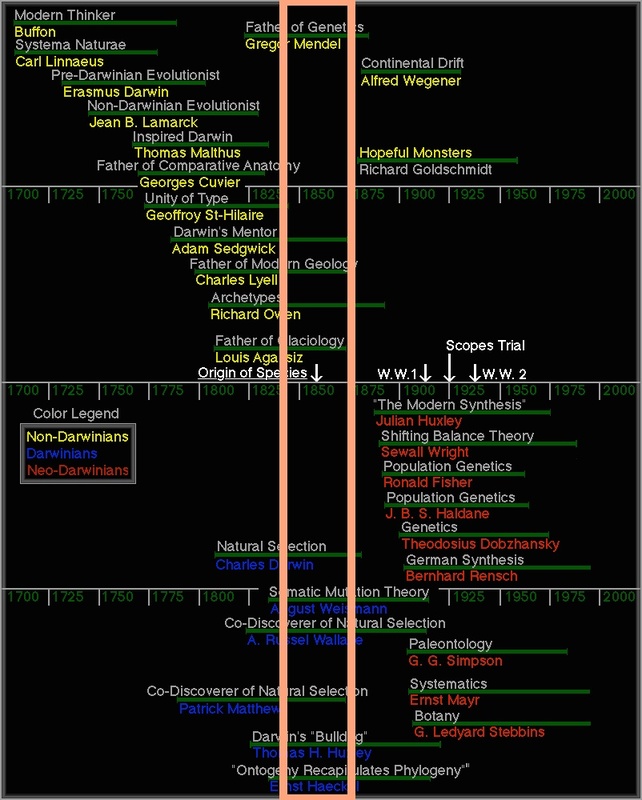 On this timeline of “notable people who have contributed to evolutionary thought” (source), I have super-imposed a salmon-colored box. This box includes the birth year of anyone 25 to 60 years old— the prime of a scientist’s life— when genetics was discovered in 1900. No timelines begin in the box. That is, the figure tells us there were no notable contributions by scientists born in this period, which includes the birth of de Vries (1848-1935), Johannsen (1857-1927), Bateson (1861-1926), Cuénot (1866-1951), Davenport (1866-1944), Morgan (1866-1945), and Punnett (1875-1967). Richard Goldschmidt (1878-1958), born just a few years later and listed as a non-Darwinian (top), was a second-generation mutationist whose 1940 book introduced “hopeful monsters” and provoked Ernst Mayr into writing a book of his own. That is, the distorted view of history that evolutionary biologists hold today is not just a matter of passive amnesia, but of a highly successful public relations campaign, what evo-devoist Stuart Newman recently called “an unremitting 90-year campaign to identify ‘evolutionary theory’ with ‘Darwinism'”. The recent paper on Mendelian-Mutationism is actually an off-shoot of a series of “Mutationism myth” blogs written for SandWalk in 2010. To turn the blogs into a scholarly work worthy of publication in a peer-reviewed historical journal was a major project accomplished over the course of 2 years, by teaming up with a history-of-science graduate student named Kele Cable. Kele recently blogged about our paper on his web site. Some of my favorites: Haldane, 1932 (the tattered volume, top, second from right); the 1911 (3rd) edition of Punnett’s Mendelism, the first textbook of genetics (the slimmer of two burgundy volumes, top center); George Williams (1966) Adaptation and Natural Selection (row 2, 9th from right, with the shiny jacket cover); Lewontin, 1974 (row 2, right end, red with gold lettering next to Crow & Kimura 1970). Other examples could be given. The Oxford Encyclopedia of Evolution (click for searchable online index) has an entry for Mendel, who made no direct contributions to evolutionary thinking, but lacks an entry for all of the mutationists except for Morgan. Importantly, the entry for Morgan says nothing of his evolutionary views, only of his contributions to genetics. Textbooks (e.g., Ridley, 1993, or Freeman & Herron, 1998) and online teaching materials (try a web search on “development” or “history” of evolutionary thought) frequently jump from Darwin to the Modern Synthesis, with the explanation that Darwin’s theory was right but needed a mechanism, and this was supplied when the architects of the Modern Synthesis combined genetics and selection. Early geneticists, if they are mentioned at all, are depicted only for their alleged failure to understand selection, accept small changes, or achieve synthesis.